Zendesk Connect lets your organization create campaigns that send messages to users on a one-time basis, or on an ongoing basis based on recurring events in your application. For example, when a user creates an account in your application, the creation event can prompt Connect to send a welcome message to the user. 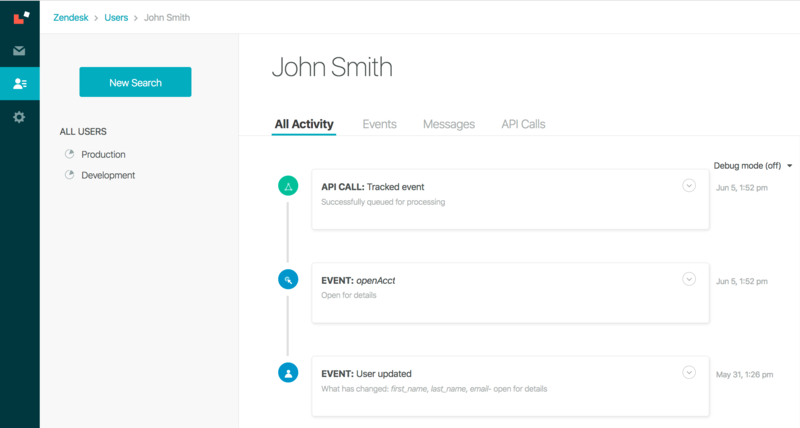 To use Connect, user and event data in your application must be sent to Connect so that Connect can react to the events and send messages to the users. This documentation is intended for developers responsible for making changes to your app to start sending user and event data to Connect. The libraries and integrations have slightly different capabilities and implementations. For example, some options provide additional functionality, such as disabling push notifications to a mobile device, or unsubscribing a user to messages. While the developer team in an organization usually implements and maintains the code for sending user and event data to Connect, the team in charge of customer relationships sets up and manages Connect campaigns. For more information, see the documentation in the Connect Help Center. Connect provides both a development and a production environment. You must decide where you want to send your user and event data -- to the development or production environment. For example, you could start by adding a subset of users to the development environment to test your integration. When you're ready, you could then sync your users to the production environment. The keys are listed on the Environments page (Settings > Environments) in your Connect account. You can test your integration by sending test data to the development environment in Connect, then checking the Users page in Connect to monitor user updates and events. Sign in to Connect and click the Users icon on the toolbar on the upper right. On the All Users page, select Development in the sidebar. Test your integration by identifying users and tracking events. If you identified a user, the new user will appear in the list after a short delay. If you tracked an event, click the user in the list that you associated with the event. The user's history will appear showing all the activity, events, messages, API calls, and user attributes associated with that user.